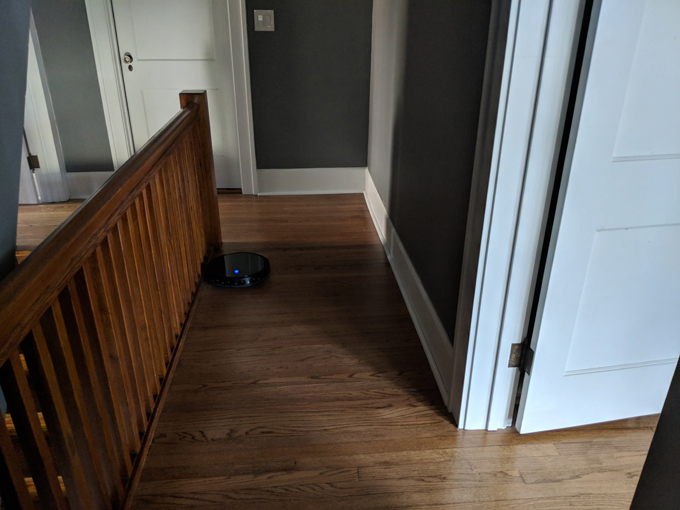 I have never owned a robotic vacuum, but was always curious about them. Having heard mixed reviews, I wanted to try one out for myself. With prices near the one thousand dollar mark for top of the line versions, I was reluctant to pull the trigger. Enter the Eufy. 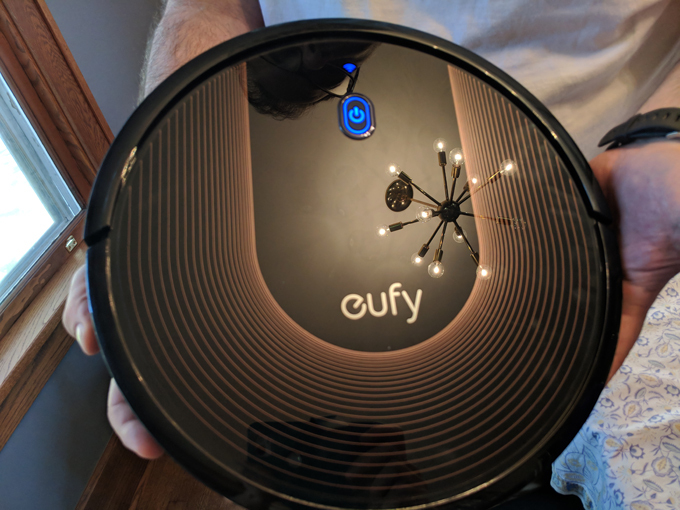 The Eufy is a moderately priced ($180 to $300) robotic vacuum that does the job quite well. 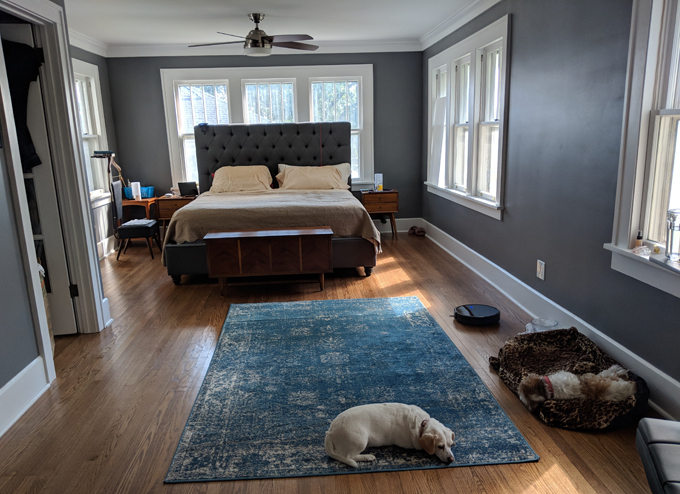 Having mostly hardwood floors and two dogs, (one that sheds excessively,) a robot that will clean up on a pre-set schedule, is a homemaker’s dream. Mine is set to run at midnight. 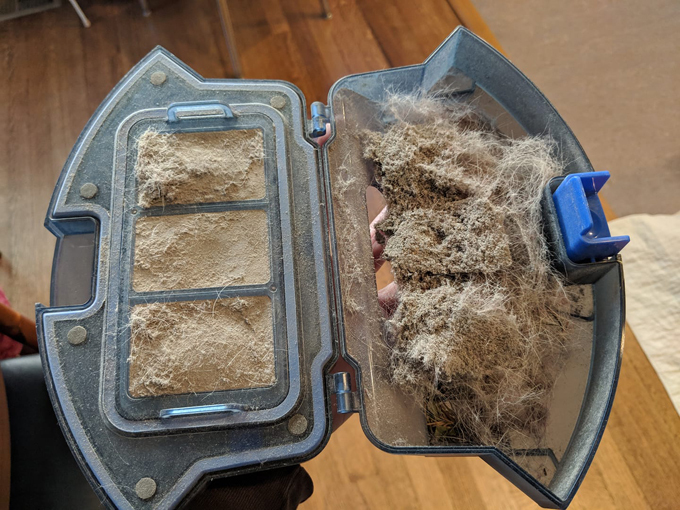 It is so satisfying to wake up in the morning and empty the Eufy dust compartment. You would not believe how much dust collects in the course of 24 hours! My daughter, who suffers from allergies has shown quite an improvement. One thing I truly adore is its ability to reach under beds and get dust bunnies out of there. It is super simple to use and we had it out of the box and charging within minutes. Make sure all cords and cables are out of the way and off the floor before use. 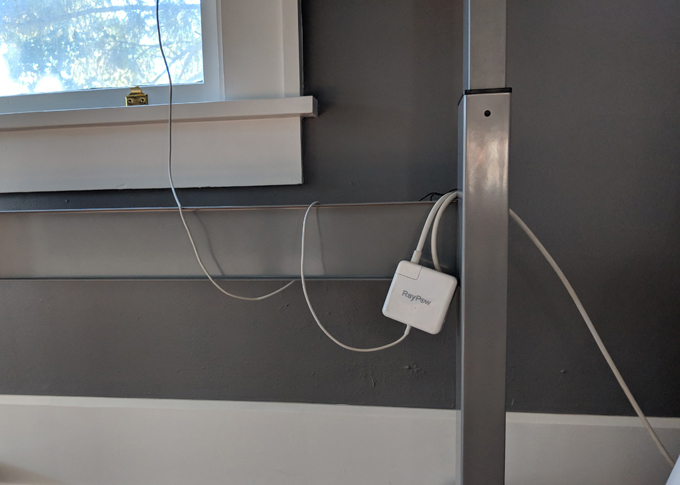 The Eufy even comes with cable tie wraps to help keep your cords and cables from dangling to the floor. If your vacuum does get tangled in a cord, it’s super easy to pull the cord right out, but could cause damage to the cable. Most area rugs the Eufy will glide right over. Daughter has a shag rug in her bedroom that Eufy has gotten tangled in a few times. 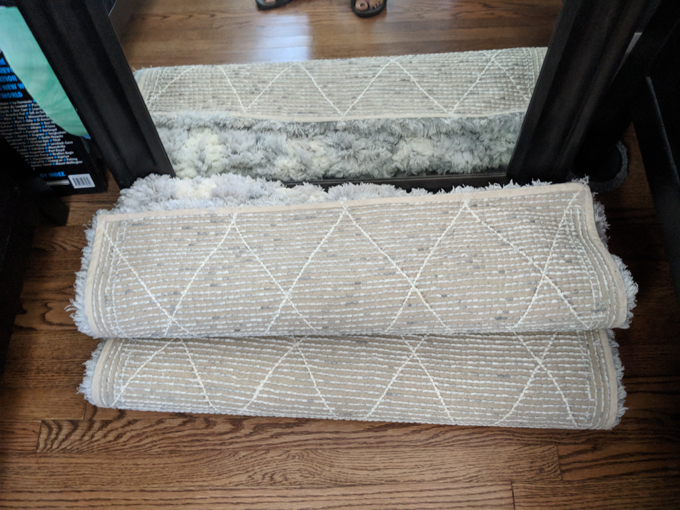 Bath Mats – rolls right over. 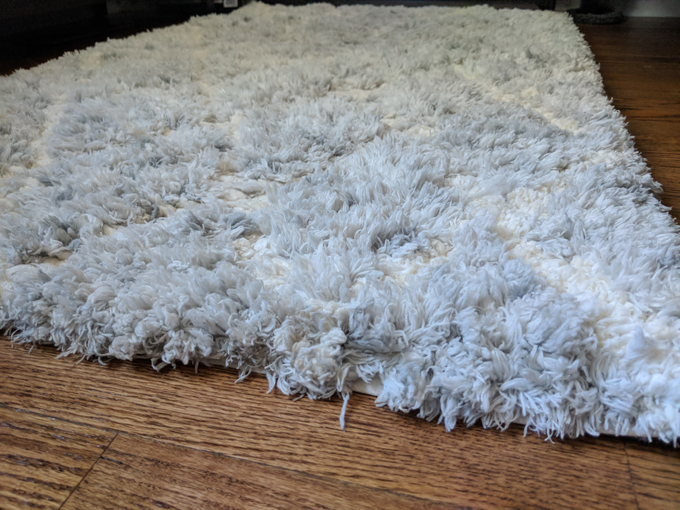 Shag Rug – can get snagged. There is a small amount of trial and error. Make sure cords are off the ground which is probably a good idea anyway. 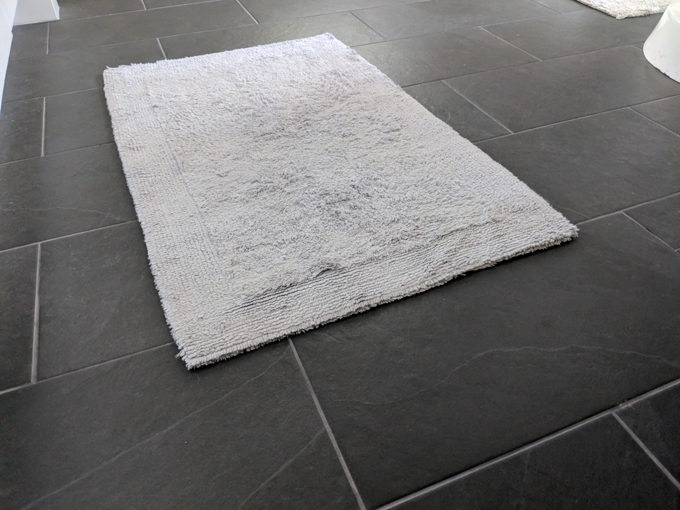 Roll up small shag rugs. Another option is to close the door and Eufy will just skip that room entirely. Shag Rugs – just roll up. Problem solved. This morning I told my daughter that if she wanted her bedroom vacuumed today. 1. Pick up dangling cords. 2. Roll up your shag rugs. 3. Leave doors open to any rooms you want the Eufy to clean. So easy, that my teen daughter was more than happy to prep her room for Eufy. The second floor vacuum is set to run at noon every day. That way the Eufy cleans our bedrooms while we are out and about. If I want Eufy to concentrate on a specific room, then I just shut the doors to the other rooms or close the door to the room the Eufy is in and let it go to town. As you can see my bedroom is quite large. Without the RoboVac I probably would not vacuum it more than once a week. 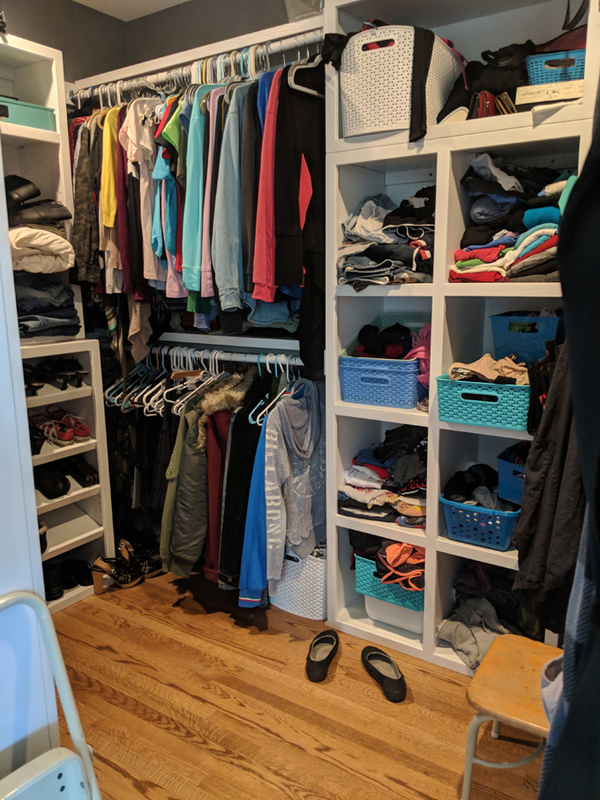 My closet is never tidy, but when I leave the door open Eufy goes in and works her magic. 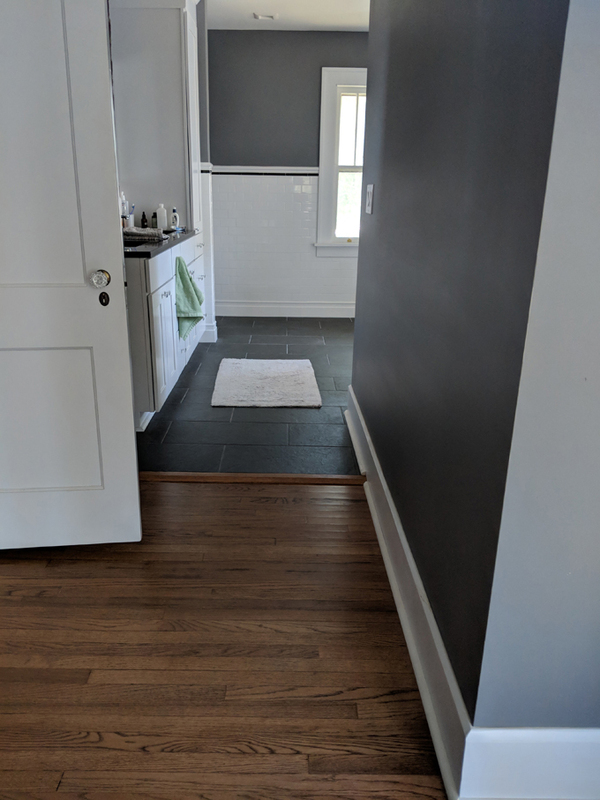 My bedroom has a master bath. You can see where the wood changes to tile. Has no problem going over floor separators and handling different surfaces. Eufy is very thorough too. She hugs around the base of the toilet. It’s really impressive how she gets every where. This is what Eufy collects every 24 hours for a family of 3 people and 2 dogs. 3 people and 2 dogs can sure produce a lot of hair, dust, dirt and debris. You are probably wondering if you have to block off a staircase for second floor use. Not at all. I monitored Eufy upon first use, and had my hands ready to grab her if she fell. It’s sensors keep it from tumbling. Such a smartie! I have 2 dogs. The younger dog has expressed fascination with Eufy and sometimes watches it work, totally engrossed. My older, blind dog, does not seem to be aware of Eufy’s presence at all. Sometimes he is sleeping right in the path of my RoboVac. I watch as Eufy navigates around him, my dog blissfully unaware. Over time the filter and brushes will need to be replaced. They are quite small and don’t take up much room. 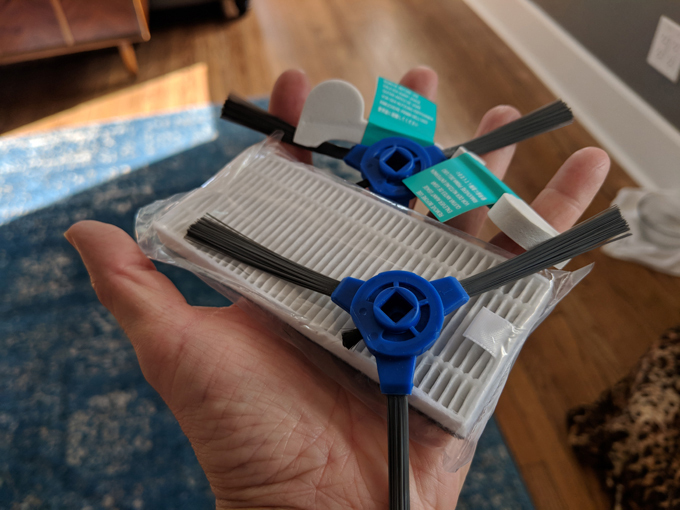 These are some extras that came with my vacuum. There are 2 Eufy Robovacs that I have tried so far. Eufy 11 did an excellent job keeping the floors clean! Eufy is having a sale this week on Amazon – $50 bucks off! Worth it for sure! Eufy 30C has an abundance of extra features. It is WiFi connected and can be controlled with their easy to use app. 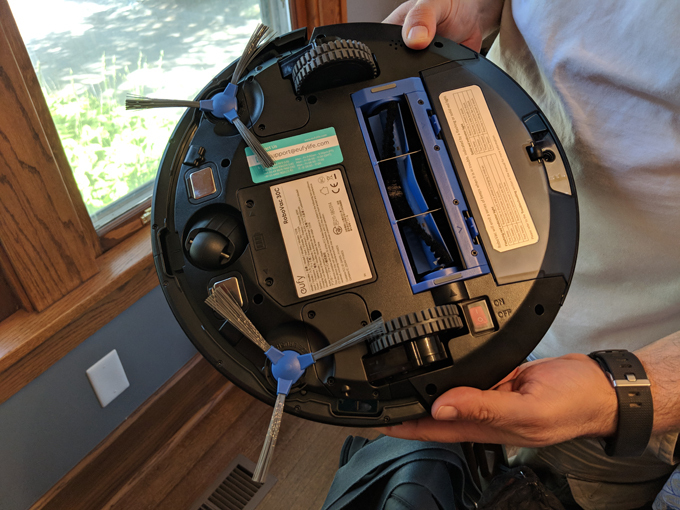 In addition to extra suction power, it also comes with strips to lay on the floor that can block off an area to the robovac. Both have cliff sensing and haven’t fallen down the stairs once. Overall I am extremely pleased with both models! Having a two story house we have placed one on each floor, and could not be happier. They really lived up to all of my dreams of having a robot vacuum. I really love these so much I’m considering a third for my basement. One last thing that I love. When Eufy is running out of juice, she gets herself back on the charger on her own! I refer to my vacuum as a her. If you get one too, you will see how it becomes a part of the family and you might even give her a name.